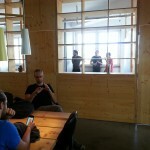 The week kicked off on Tuesday with a welcome from Alex Farcet, the organizer of Startupbootcamp Berlin. Apart from helping entrepreneurs accelerate their business, Alex also wants to create a friendly and helpful work environment. So everybody had to introduce themselves. At the same time Alex gave us a challenge: the first to remember all names of all the teams and the Startupbootcamp crew wins a giant bottle of champagne. Daniel Rieth from the team flux reeled that in on Friday. After introductions we dived straight in, Kees van Nunnen, also known as the “Lean Jesus”, gave us a two day intensive workshop on the lean startup approach. The lean approach focuses on running experiments that give you real world feedback on where you need to steer your company in order for it to be successful. After all this input we designed our own experiments, which we are going to run this week. After that we will have a much better idea on how people use shoutr BETA and what we need to build in order to create a better experience for our users. Work on this continued until Friday when the guys from Startupbootcamp took us on a Berlin ecosystem tour. First we visited the betahaus, a building that houses co-working spaces, a café, several woodshops and a couple of other spaces to be creative. It is a great place to meet people from the startup community. 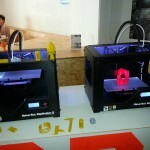 They have even got the 26th MakerBot ever produced! But it was not only fun and games at betahaus. We had to give an elevator pitch in betahaus’s own elevator. It will soon be available on VentureVillage. 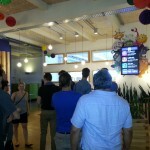 Then it was off to Wooga, the world’s second largest social gaming company. Their offices are a mixture of a giant playground and a tree house. It must be a really fun place to work there. After the ecosystem tour we headed back to Startupbootcamp for a housewarming party of our co-working space. Aaron our chef was already roasting a pig on a spit and a lot of people came in to have a look and network. As if this wasn’t enough, of course, we had to pitch again. By now nothing is easier as that. So the first week of Startupbootcamp ended with a bang rather than starting off with one. There was still a lot to do, however, so got back to work on Saturday and transitioned into week two. Next are the learnings of our experiments. So come back and stay up to date. Unfortunately, not the historic no. 26. 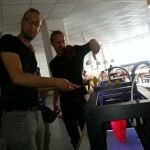 Christian and Sebastian are excited about the MakerBots. At betahaus they like to build everything themselves. The screen on the upper right-hand side shows the growing number of users of their games.